Nominal cooling capacity 450 - 1349 kW. 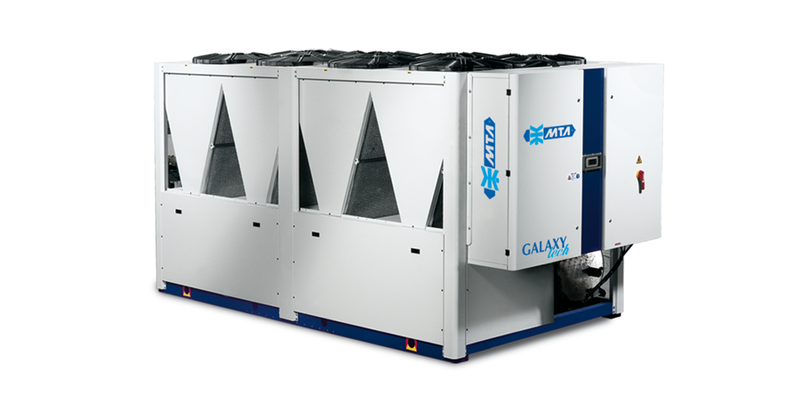 The chillers of the GALAXY TECH series, with environmentally friendly R410A refrigerant, represent the best solution for centralised hydronic air conditioning for large areas (such as airports, offices, shopping centres, cinemas, etc. ), and offer energy savings in all operating conditions. The multi scroll technology used in the GALAXY TECH series, proportionally adapting the cooling capacity produced to the actual demand from the system, allows a decrease in the hydraulic volume required for thermal inertia as well as considerable energy savings. The high number of compressors (up to 12) and independent refrigeration circuits (up to 4) reduce the possibility of downtime, increasing the level of overall reliability of the system, thus ensuring continuity of operation in a wide range of applications. The modular condensing section allows the progressive stopping of fans according to the instant thermal load, helping to increase the seasonal energy efficiency of the units. 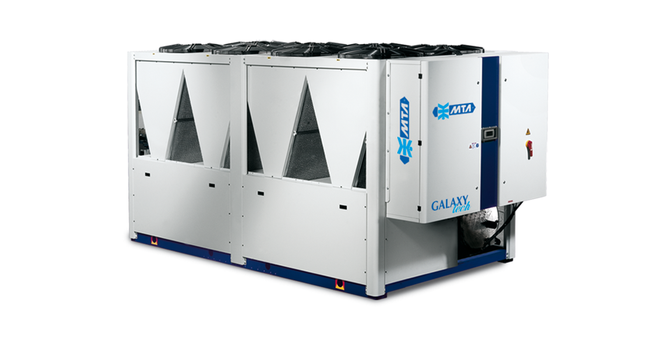 The GALAXY TECH series is equipped with brazed plates heat exchangers in AISI 316 stainless steel with high energy efficiency and low water pressure drops. Management is entrusted to a microprocessor control that manages completely independently all the main functions, including the adjustments, alarms and interface with the outside. Integrated hydraulic group composed of either: single or double circulation pump with mid and high available head pressure, storage tank, expansion vessel, safety valve, pressure gauge. Data declared according to UNI EN 14511:2013.All data refers to standard units at the following nominal conditions:Evaporator water inlet/outlet temperature 20/15 C, external air temperature 25°C.